For a Gulf Coast adventure, Corpus Christi is a must-see and one of the world’s top kiteboarding destinations. Just down the road from Corpus Christi is Port Aransas, a coastal town where chartered boats with local guides and equipment are available for deep sea fishing experiences that will have you reeling in red snapper, wahoo, blue marlin and more in a matter of hours. Galveston, a unique 32-mile beach town, offers everything from soft sandy beaches to one of the largest, most historically significant collections of 19th-century buildings. Additionally, Galveston is one of the top locations for birding in the United States as the island is home to more than 500 species of birds. If you prefer mountains to waves, West Texas is the place for you. You’ll be amazed by the beauty of the Big Bend National Park in Big Bend, the Davis Mountains State Park in Fort Davis and the Franklin Mountains State Park in El Paso. 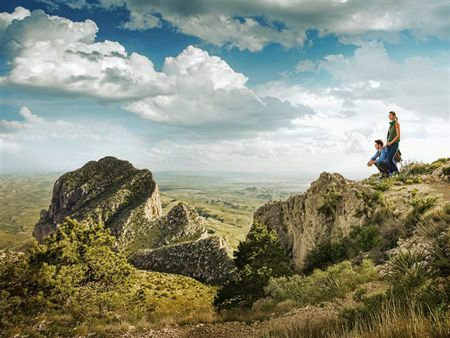 In addition to hiking through scenic mountain ranges, West Texas is home to many outdoor activities. Take a dip in the world’s largest spring-fed swimming pool, Balmorhea, horseback ride, white water raft on the Rio Grande River, kayak, canoe, stargaze at the McDonald Observatory and more. Want to make a splash? Take a swim in one of Austin’s swimming holes. Barton Springs Pool is one of Austin’s famous landmarks and easily the most popular swimming hole in the city. Spring fed, Barton Springs Pool is over three acres and remains 70 degrees year round. Another famous swimming hole, Hamilton Pool, was created thousands of years ago when an underground river collapsed creating the sunken grotto. With a 50-foot waterfall spilling from an outcropping of limestone into the jade green pool, it is a site to behold. Not near New Braunfels? Don’t worry! There’s plenty of fun to be had in Arlington at one of the biggest theme parks in the state, Six Flags Over Texas. Its claim to fame is The Texas Giant, while the kids will enjoy Bugs Bunny Boomtown. Across the street, more than 3 million gallons of water await at Six Flags Hurricane Harbor. In San Antonio, Six Flags Fiesta Texas offers a variety of musical performances and shows in addition to rides. The park is home to Batman: The Ride, a new world class 4D Free Fly Coaster that thrusts riders into an immersive, high-speed Gotham City adventure. Perhaps the most important theme park of all in the state of Texas is Morgan’s Wonderland. Located in San Antonio with inclusion as its guiding principle, Morgan’s Wonderland was designed with special-needs individuals in mind and built for everyone’s enjoyment. The 25-acre, completely wheelchair-accessible park features more than 25 attractions. Not to mention, San Antonio is home to the UNESCO World Heritage Site San Antonio Missions. 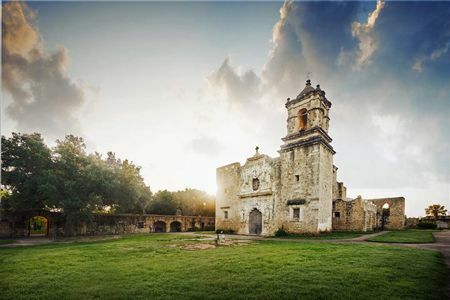 The state’s most iconic mission is the Alamo, however, Spanish priests established five additional Catholic missions: San Antonio de Valero, San José, Concepción, San Juan and Espada, along the San Antonio River. The traditions established by the mission’s friars still influence the culture of San Antonio today.